Agreed value options up to $1300 p.w. We are continually innovating to ensure we have the best Accident & Sickness product in the market. Our sole goal is to do Accident and Sickness differently. Not just be another “me too” product. Utilising our extensive experience we have improved the product offering, whilst ensuring market leading rates. We are continually working with our brokers to innovate and keep developing accident and sickness products that are better for their clients. Online quote, bind & manage. 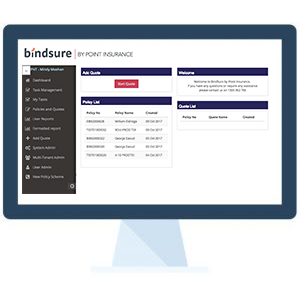 Register now for BindSure and commence your first quote and compare the difference. Point Insurance is driven to make an impact in the Underwriting market by providing exceptional service and quality products. Our claims process is centred around brokers and their clients. Pro-active, communicative and professional.